Robert Weatherbee and Veda Barrie Weatherbee scored 0.34 masterpoints with a 50.69% game at St. George Bridge Clubs. See full results of this game. Bob Weatherbee and Veda Barrie scored 0.80 masterpoints with a 57.2% game at St. George Bridge Clubs. See full results of this game. Sherry Mann and James McNerney scored 0.28 masterpoints with a 53.71% game at St. George Bridge Clubs. See full results of this game. Sherry Mann and James McNerney scored 0.24 masterpoints with a 56.25% game at St. George Bridge Clubs. See full results of this game. Robert Weatherbee and Veda Barrie-Weatherbe scored 0.56 masterpoints with a 53.64% game at St. George Bridge Clubs. See full results of this game. Bob Weatherbee and Veda Barrie scored 0.80 masterpoints with a ★60.23%★ game at St. George Bridge Clubs. See full results of this game. Bob Weatherbee and Veda Barrie Weatherbee scored 0.62 masterpoints with a 55.55% game at St. George Bridge Clubs. See full results of this game. 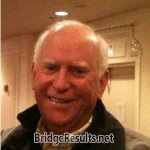 Sherry Mann and James McNerney scored 0.24 masterpoints with a 52% game at St. George Bridge Clubs. See full results of this game. Robert Weatherbee and Veda Barrie Weatherbee scored 0.45 masterpoints with a 50.93% game at St. George Bridge Clubs. See full results of this game. Sherry Mann and James McNerney scored 0.25 masterpoints with a 53.82% game at St. George Bridge Clubs. See full results of this game.